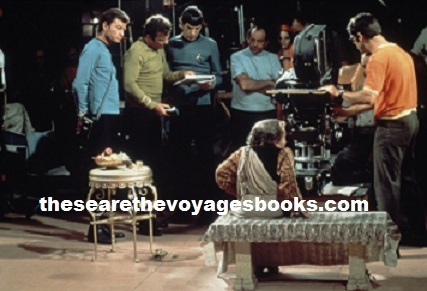 47 years ago this week, the Star Trek cast and crew were filming “Plato’s Stepchildren” with guest star Michael Dunn. As any Trekkie worth their weight in salt knows, this was the episode that brought about the first interracial kiss on network TV. It was a whole different world in 1968, but Star Trek was determined to take us into the future. What was the conflict on the set during the filming of this historic episode? Caution on the postures and actions of our four principals so no impropriety can be suggested. The embraces must not be such as would embarrass a viewer, and there must be no open-mouth kissing. 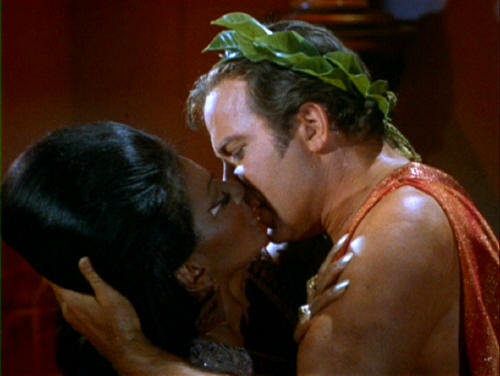 Further, it must be clear there are no racial overtones to Kirk and Uhura’s dilemma. Filming commenced on Monday, September 9, 1968, and planned for six days, but they were running late, and it was on the final day of production -- an unplanned seventh day, Tuesday, September 17 -- when “the kiss” was finally ready to be captured on film. Work took place on the South Wing set, this time with wall panels sliding away, revealing the Platonians seated in theater-type boxes, watching as Kirk, Spock, Uhura, and Chapel are forced to act out numerous romantic scenarios. Director David Alexander had the final nine pages of the script left to film, which had to be covered this day. No more delays were allowed, no more excuses accepted. Filming began at 8 a.m., but shortly after came to a sudden stop when several NBC executives showed up on set. Roddenberry suggested a compromise for the scene between his star (Shatner) and his former lover (Nichols). The scene could be shot two ways -- one with a kiss, one without, and a decision could later be made in editing. Shatner remembered how the network men were on the sidelines, watching intently. The real kiss came first. Alexander was satisfied with the coverage. The blocking had Shatner pull Nichols to him and turn her away from camera just slightly. We see his eyes. We see the two faces come together. But we don’t see the lips actually touch, only an insinuation that they do. 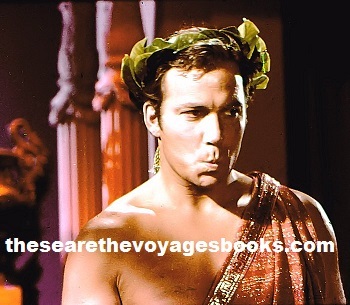 Then the scene was shot again, with Kirk, as a show of defiance to the Platonians, fighting the telekinetic manipulation and struggling to keep his lips from connecting with those of Uhura. The NBC men on the sidelines could not see that Shatner had made a face and crossed his eyes. They felt everything had gone right and they would be victorious. Days later, after the sets had been torn out, after the next episode was underway, the footage was screened … and only then did it become clear that there was only one usable ‘take’ -- the real kiss. NBC had no choice but to relent.